A firmware update shaves 0.1 seconds off of the 0-60 time. We all get firmware updates pushed wirelessly to our phones, our consoles, even our refrigerators (if you're cool like that). But our cars? No (for most of us, at least). 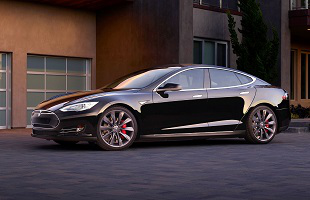 But that's how Tesla Motors handles firmware on the Model S sedan, including the latest iteration of the four-door saloon: The P85D. Most of these cellular-based firmware updates tweak battery settings, in-cabin tech, and so on, but the next P85D update will put a little extra rubber on the road. "Tesla P85D 0 to 60mph acceleration will improve by ~0.1 sec soon via over-the-air software update to inverter algorithm," said Tesla CEO Elon Musk on Twitter today. The inverter controls current flow in the P85D, and the update presumably alters the algorithm to provide more flow when the car launches (or if you aren't on a drag strip, when you put your foot on the accelerator). The update will also improve acceleration on the standard, non-dual motor version of the Model S, but not as significantly. The P85D is already one of the fastest cars off the line, with an advertised 0-to-60 speed of 3.2 seconds. Bringing that down to 3.1 seconds doesn't have a dramatic impact on the rarefied air the P85D basks in already, but it does bring the time in line with some seriously super...supercars, like the 2012 Pagani Huayra -- a $1.6 million ride. Musk went on to say that the original intent of the dual-motor P85D was to gain "insane traction on snow," and that "...insane speed was a side effect." If my aging all-wheel drive Subaru Outback handles the snow like a champ, imagine what this sucker can do.